Minister for Heal Rosy Akbar handing over the new Ambulance keys to the ambulance driver from Ba Joseva Nabuta on April 9,2018.Photo: Simione Haravanua. The handing over of 18 new ambu­lances to their respective depart­ments will be an added boost to the Ministry of Health and Medical Services. 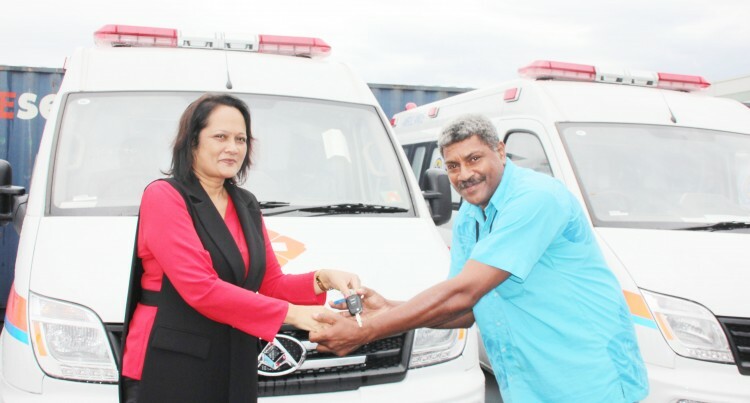 Minister Rosy Akbar handed over the keys to the new ambulances in a cer­emony at the Fiji Pharmaceutical and Biomedical Services at Jerusalem Road in Suva on Monday. Ms Akbar said that the new ambu­lances were to be taken to various sub-divisional hospitals and health centres by the drivers after the ceremony. She said the drivers had undergone extensive training and instructions on how the vehicle should be utilised. “Whenever there is a case of an am­bulance involved in an accident, it sad­dens all of us not only for the fact that we are running short of ambulances, the fact that the vehicle that is sup­posed to transport the patients from one facility to the next,” Ms Akbar said. She told the drivers to be make sure there were no mishaps with the vehi­cles and advised them to be responsible for their safety, as well as for the safety of their accompanying medical staff and the patients they would be trans­porting.